You can calculate 0.875 as a fraction with just a few steps, leading you to its simplest form will give you the fraction 7/8. Below we will cover how to convert decimals into fractions and then how to distill these fractions down into their simplest forms. The first step of converting a decimal into the simplest form of a fraction is to convert the decimal into a fraction, any fraction. Knowing some things about the properties of fractions and decimals and the relationship between them will help you achieve this. Recall that decimals are used to represent a portion of a whole number. The numbers that come after the decimal point have columns and number places much like whole numbers do. The tenths place is the first column after the decimal point, while the hundredths place is the second column after the decimal point, and the thousandths place the third column. So the number 0.73 isn’t a whole number, and it reflects the fact that you have only 73% of a whole number. You can know this because it decimals have an easy to remember relationship with percentages. The number one is always equivalent to 100%, so in order to take a decimal and converted into a percentage, you merely have to put the decimal in the hundredths place or move it over to spaces to the right. So the numbers 0.28 easily translates into 28%. The two is in the tenths column and the eight in the hundredths column. 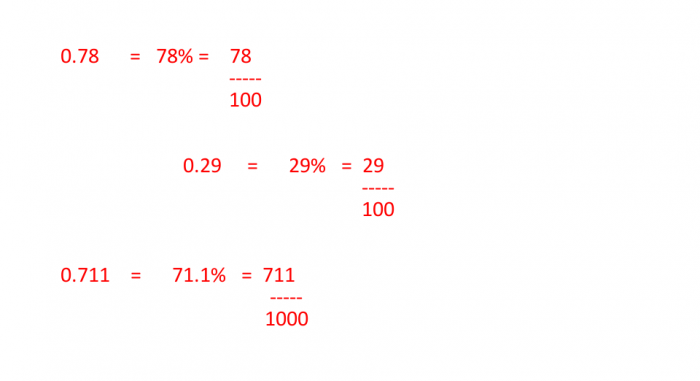 Now that you’ve converted a decimal into a percentage, turning that percentage into a fraction is quite easy. You simply count of the number of places behind the decimal point and then add that number to the decimal as a denominator, turning it into a fraction. If you have the decimal 0.600, you’ll notice that the zero is in the thousandths place. So all you have to do is put 600 on top of the numerator and 1000 on the bottom as the denominator giving you 600/1000 or (0.600% as any complete fraction will always be equal to one). However, the fraction 600/1000 could be much smaller and simpler. It could be put into its simplest form or lowest terms. How do you determine that the smallest fraction that could possibly represent the decimal and reduce the fraction down to its lowest terms? You need to isolate something referred to as the greatest common divisor or greatest common factor. This means finding the largest number that evenly divides into the numerator and the denominator of the fraction. 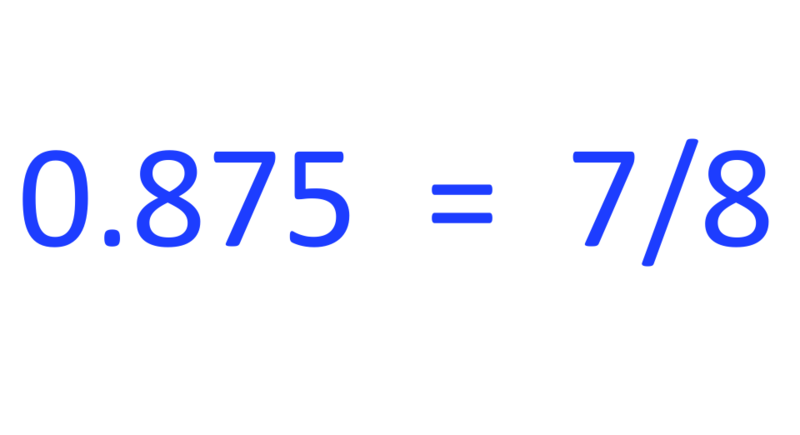 For the fraction 600/1000, the greatest common factor between them is 200. Dividing 200 into both the numerator and the denominator gives us ⅗. Now let’s look at the example of 0.875. We first have to convert it into a fraction, which is easy and is 875/1000. We then need to set about finding the greatest common factor for the fraction. It turns out that the greatest common factor of 875/1000 is 125. Dividing 125 into both the numerator and denominator gives us 7/8. In the examples we’ve looked at above, we already had access to the greatest common factor of the fraction. Typically though, you’ll need to do some calculations to find the GCF. Determining the greatest common factor can be done by creating a list of primes for each number, and then multiplying out the prime factors which are common to both numbers. The two numbers share the common factors of 2 and 3, and these are both prime numbers, which gives us six when multiplied together. Now we divide six into both 30 and 42 to get 5/7. Let’s do one more example, but this time let’s list out any factors we can think of. Let’s take the numbers 180 and 210. They share the factors 2, 3, 5, 6, 10, and 15, in this case the largest factor they have in common from this list is 15, which when multiplied by two gives us 30. 30 is indeed the GCF for 180/210 (you would have also found 15 by multiplying common primes 2, 3, and 5 together. 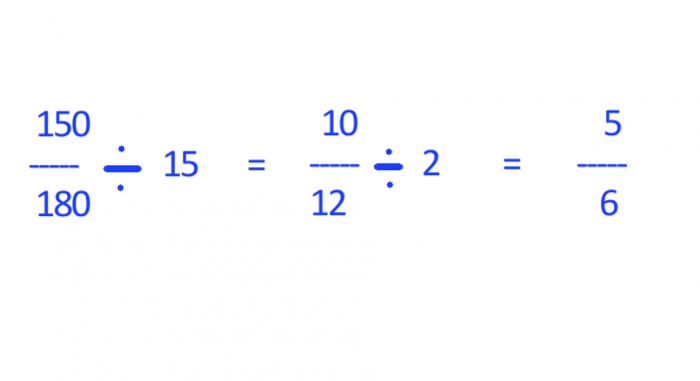 Dividing 30 into the fraction gives us ⅞. In this case, if you had continued listing out the factors, you would have discovered that 30 was the greatest common factor between the two numbers eventually. However, when working with large numbers listing out every factor can get difficult, so using the prime factorization method is often quicker. An alternate method of determining the greatest common factor is the division method. Using the division method means dividing the numerator and denominator of the fraction into smaller and smaller pieces, until the two numbers can’t be divided any further. Essentially, every time the two numbers have common factors which can still be divided, divide them until you can’t proceed any further. Let’s attempts to find the greatest common factor of 75 and 180 by implementing the division. Let’s start off by dividing 180 by 2, which gives us 150, subtracting 150 from 180 leaves us 30. Now let’s divide 75 by 2 to get 60, and subtracting 60 from 75 leaves us with the remainder 15. Now we just divide 30 by 15, which divides evenly by two with no remainder. Therefore we know that the greatest common factor of 180 and 150 is 15. Dividing 15 into both 180 and 150 gives us 5/6. Remember how easy it is to turn fractions into decimals by just shifting the decimal places over to the right until you reach the last number in the decimal. Count how many columns you had to move the decimal place over and add the value of the final column’s position to the denominator (so if the final number was in the thousands, put 1000 under the fraction as the denominator). To determine the simplest form of the fraction you just created, set out to find the greatest common factor or greatest common divisor. You can use several different methods to find the greatest common factor. You can simply list out all the factors until you find the largest number that divides into them. This is typically a time-consuming with larger numbers, however, so an easier way to do this is to list the primes of each number and than multiply together the common prime factors. Finally, if you would prefer to divide to find the greatest common factor, simply keep dividing the numbers by common factors until they can’t be divided by common factors any longer (until they are in their simplest form).